Catch Up: The Week That Was! 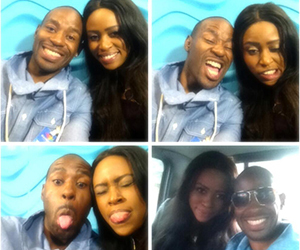 This week started off on a rather sad note, with the Eviction of The Chase's golden couple, LK4 and Koketso. The two lovebirds were booted out after HoH Selly saved Biguesas and put Koketso on the chopping block instead. LK4 scored the highest number of Nominations from his fellow Housemates and was subsequently sent to the gallows by Africa. Monday afternoon brought on the stressful Nominations which saw Neyll, Natasha, Biguesas, Pokello and Annabel being put up for possible Eviction this week. Bolt was also up for possible Eviction, but was lucky enough to be saved by Melvin. The Sierra Leonean celebrated by allegedly hitting on Nigeria’s Beverly, despite the fact that he is currently involved with Betty. The lingerie model was not in the least bit amused by Bolt's advances and sounded off in the Diary Room. South Africa's Angelo had a bit of a depressing week after Maria blew him off because she is currently involved in a relationship outside the Big Brother House. Maria is one lucky woman because Natasha apparently also hit on her. The Chasers were able to ease some of the Nominations tension with this week's incredible Task which saw the Housemates exercising their creativity. The gang baked, posed and painted their way to a well deserved Task Victory. This week was not without it's fair share of drama, however. Head of House Selly recieved a harsh talking to, as well as her First Strike after dumping a glass full of booze over Pokello's head during last week's debaucherous Channel O party. Also, the revelation of a third House, called the Emerald House, caused widespread panic and paranoia in both the Diamond and Ruby Houses, with many Housemates thinking the phantom House actually exists. On Friday afternoon, Neyll and Maria were moved to the Diamond House by HoH Selly, while Fatima and Feza were sent to the Ruby House. Drama unfolded soon after when Maria told Hakeem that Cleo refused to move to the Diamond House because she doesn't want to live with him. The Zimbabwean decided to call time on their relationship after this revelation. He also swore he would not pitch for their date in the Rendezvous Room. Hakeem then had a change of heart and showed up afterall. What a crazy week it's been! What were your favourite moments from the last seven days of The Chase?